Easter is on Sunday and I am very hoppy about that. I know, hardy har har:) My sister, niece, and nephew are coming over tomorrow to dye eggs. We are also going to do a little egg hunt. Caleb thinks eggs are balls so he should dominate the egg hunt:) He is getting raisins and pretzels in his eggs, no candy yet! Sorry kiddo! 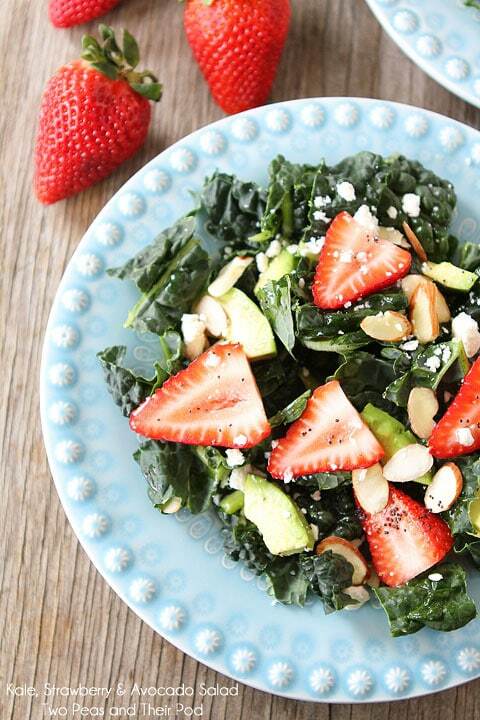 Kale salads are trendy right now. All of the cool kids are eating them. I am not a trendy person, especially when fashion is involved, but I am going to consider myself trendy now because I love kale salads. And this kale salad is the incredible hulk of salads! I top the kale with all kinds of goodies. 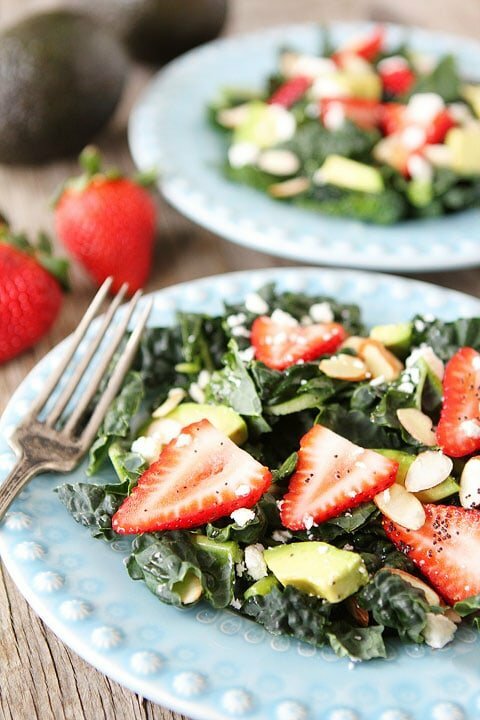 Strawberries and avocados are making their way back into the grocery stores. I guess they are always there, but now is their season to shine! I am so happy about that because I love them both! They are so good in this salad too. Not only do they make the salad pretty, but they are tasty! I also add almonds and feta cheese. I drizzle a simple Lemon Poppy Seed dressing over the salad before serving. And when I say simple, I mean simple. I put all of the ingredients in jar and shake like crazy. The dressing takes about five seconds to make. No need to buy dressing. The dressing is light, refreshing, and I love the pop of poppy seeds! 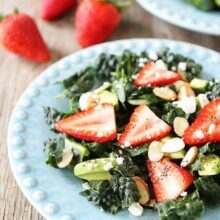 If you haven’t tried a kale salad, join the club and make this Kale, Strawberry & Avocado Salad with Lemon Poppy Seed Dressing. It’s easy and soooo good. You will feel trendy after eating it. Move over Kardashians, Bieber, and whoever else is trendy right now. I don’t even know. Remember, I am not trendy:) We are taking over the world with this kale salad! Happy Easter weekend! Don’t forget to enter our Calphalon Easter Giveaway! This sounds delicious! I’ve used kale in my kitchen before, but mostly in soups, so salad will be a first. One question though: why do you need to massage the leaves until they change colour? Such a beautiful and simple salad! I love the addition of strawberries. And great idea to put pretzels and raisins in the eggs instead of candy! This looks divine (trendy or not)! 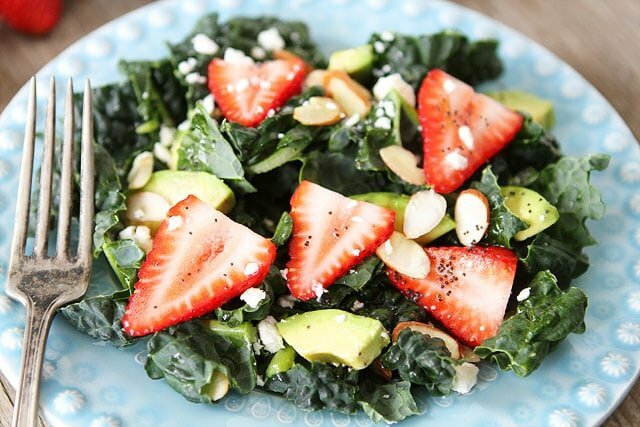 I love the idea of adding strawberries to salads! I love berries on a salad, it makes it more colorful and of course more delicious as well. Looks delicious! We are also not having ham. We make pasta every year…this year it will be pasta with asparagus and spinach…yum! I just made a salad like this last week and it’s amazing ! I love the combination of avocado and strawberries! It really makes for a nice salad! This looks fabulous! Looking forward to trying it for Passover company, without the poppy seeds. Have you ever tried lacinato kale? Trader Joes sells it precut right next to the regular kale. It’s much softer and more tender. I use it for salads and stir fried with apricots. I love kale! This salad looks so fresh and glossy from that dressing YUM!! so pretty! I love all these ingredients so so much! Happy Easter! This is gorgeous. 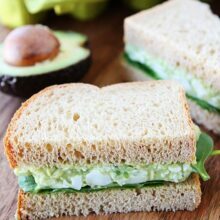 I love the dressing and fresh spring ingredients! I wanted ham 🙁 The turkey won…. But this salad looks like it will happen! Cutting the last of the kale from our greenhouse in order to get spring things moving! What a nice strawberry salad! I do not use kale in salads nearly often enough! I’m the queen of kale salads. So tasty! This looks perfect for spring! Gorgeous salad, and so nutritious – I love it! Mmmmmm, perfect for Easter brunch! Wonderful flavors and textures in this salad, Maria. Happy Easter! This is definitely my kind of salad! I love massaged kale salads. Great edition with the avocados, strawberries, and dressing. Happy Easter! Perfect for Spring and Easter! Excited to see what new Easter tradition you come up with! Whatever you end up making, I’m sure it will be delicious!! I am making a veggie-full lasagna. Unfortunately there were also be ham present, but I’m not in charge so there’s not much I can do. LOVE the fresh flavors in this salad! Strawberries in salad are a major favorite of mine! I love this! You’ve got some of my favorite salad toppings here! This looks delicious, Maria! Can’t wait to give it a try! We’re keeping things low key this Easter, too. It’ll be a busy week, and I do hope I see you next weekend! This is a gorgeous salad, Maria. So full of everything I love! Thanks for this wonderful looking recipe! I was searching the web for a lemon poppy seed dressing to use with a strawberry/avocado/almond chicken salad from Southern Living. Now I can use your recipe for the greens and the vinaigrette. I love kale salads and make them all the time. 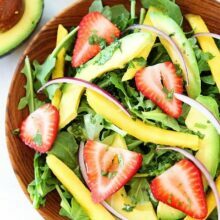 Making it sweet and fresh with strawberries, avocados, and lemon juice sounds perfect for spring! This looks really wonderful! We love kale and eat it a lot – hoping that the overwintering stuff in the garden has survived our cold snowy spring. Then I can pop some of it into this! This looks fantastic! I LOVE kale…my hubby, not so much. 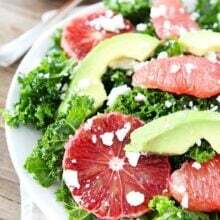 Its so incredibly good for you, so I try to make it whenever I can, and this is a salad I think I could get my hubby to eat as it has so many great things in there! Another idea is to use baby kale, which I’ve found at Whole Foods. Its more like arugula in terms of size and texture, but still dark. Thanks for the great recipe. I’m going to add it to our Pinterest “salad” board and post on Facebook too! Looks SO good! Fresh, healthy and delicious! Love love LOVE kale salad! I like to “marinate” the kale in the dressing a bit before eating. Didn’t know about the salt massage! This salad looks amazing! I absolutely LOVE kale salads! I will be fascinated and thinking about what you will be covering here. Just made this tonight! FABULOUS! I substituted crushed pecans for the almonds. Definitely a new fave! Pingback: Food creations: the start. | yes, mmhmm. I often make kale salads and found that if you toss the prepared kale with a little olive oil and leave overnight it will be tender. I like pineapple with my kale. Had this at a friends house and for the first time I liked kale. It took about 5 minutes to make this great healthy salad. While this salad looks beautiful and SO good, fresh, healthy, and delicious as stated above, it was a HUGE disappointment. I followed the recipe exactly as it was written, including massaging the kale. The salad was too sweet; perhaps a dressing with vinegar would have been an improvement. Though I love kale, I will not make it again. The picture is much more appealing than the actual salad. It is unfortunately not a keeper. Did anyone above actually make it? There are many comments about how it looks….and the anticipation of how it might taste! I just made this today. Delicious!! I had to keep it nut free for the gathering we were going to so i used pepitas in place of almonds and my 4 year old daughter requested i had cucumber so we did. Even my 4 year old ate this nutrient packed salad happily. 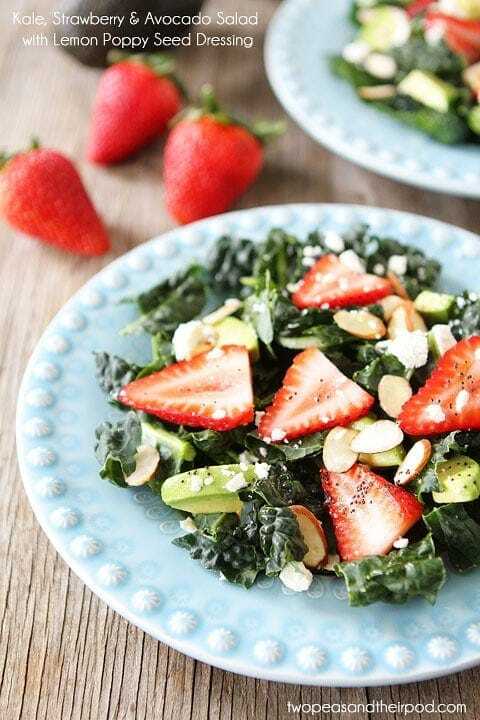 She chose which kale salad to make and called it “Strawberry Salad.” Other moms at the gathering commented at how great my daughter was with eating vegetables… little did they know she is not always so willing. I’ll definitely make this again. And i think the tip about massaging the leaves with sea salt is the secret. Tender, non-bitter kale… amazing! I just made this for dinner tonight. It was SO YUMMY!!! Even my 11 and 8-year-olds liked it. I will definitely use this recipe again – THANKS!!! Pingback: PBErgo | Oh, Kale Yeah! 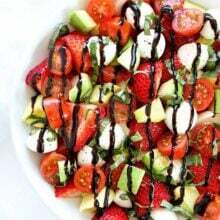 Perfect Combo,This Sounds So Delicious,Beautiful and Simple Salad,Thanks for sharing..
Pingback: Summer Salads That are Healthy, too! Looking forward to trying this with a white sangria or sweeter crisp Riesling!